When asking Dental Assistants how many of them use rubber dams in their practice, it’s shocking to see the show of hands. Studies show that only 15% of dental offices use rubber dams for adhesive procedures. Excuses come up such as; it takes too long to place, we just use cotton rolls, and retractors get the same results. With so many new and innovative dams introduced, dam placement takes minutes. Why take chances? 1.Visibility is much better due to the contrast of colors of the dam and the teeth being prepared. 2. Creates dry and non-contaminated field from saliva and other debris during all bonded procedures. 3. Improves access during dental procedures by retracting the lip, cheek, and tongue from the field of operation. 4. Protects the patient from swallowing any debris such as the removal of amalgam, old porcelain, and composite. 5. Increases the efficiency, productivity and reduces the time required for treatment. 1. Tooth may be too short to hold a clamp. Dental Dam material is available in pre-cut squares of 6×6 and 5×5 inches. The 6×6 is used for posterior applications. The 5×5 squares are for anterior application and primary detention. The thickness gauge of a dental dam can vary from thin to heavy. Thin is used for endodontic, medium is the most popular for easy placement, and heavy is used for tight contact and areas that need for stronger support. Dental Dams come in a wide variety of colors. The most common colors are grey, blue, pink, purple, green, white, and yellow. They can also come scented or unscented, flavored or unflavored. Most dentists prefer the darker shades for contrast. A dam napkin can be placed between the dental dam and the patients face. This helps to absorb moisture and increase comfort for the patient. A dental frame is necessary to stabilize and stretch the dam tightly over the teeth. Frames come in plastic as well as metal. Both can be cold or heat sterilized. Lubricants such as topical such as Ultradents, or KY jelly, can be placed on the underside of the dental dam for easier placement over the teeth and through the interproximal areas. The dental dam hole punch is used to create holes in the dental dam needed to expose the teeth that are to be isolated. The working end of the punch is used to puncture the dam for the correct hole sizes. Sometimes it is hard to know where to cut the holes on the rubber dam. This is where a dam template is handy. The dam template and stamp inkpad allow the assistant the exactly where to place the holes if the teeth are out of the arch form. Dental Forceps are used to place and remove the dental dam clamp. The beaks of the forceps fit into the holes on the jaws of the clamp. The handles have a spring action that allows the forceps when squeezed to open up and fit over the tooth. When the handles are released, the clamp is let go. A dental dam clamp is used to stabilize the dental dam. The dam clamp holds the dental dam secure on the end nearest the tooth that is being treated. Clamps can be ligated for security and safety of the patient from swallowing if the clamp becomes dislodged during treatment. Mark and punch the hole positions. Select the correct clamp and ligate. For Posterior Isolation, Always go one tooth distal to the tooth (teeth) being treated and extend to the midline. Anterior Isolation include pre-molar to pre-molar. Position the clamp over the tooth with the lingual jaws of the clamp first, then the facial jaws. During the placement, you may need to keep your finger on the clamp to keep the clamp from coming off before it is properly seated on the tooth. Stretch the Dental Dam that has been punched over the anchor tooth. The ligature (floss) should be exposed and easy to grasp if needed. Position the frame over the dam and slightly pulling the dam to catch on the prongs of the frame. Fit the last whole of the dam over the last tooth to be exposed at the opposite end of the tooth that is anchored. Using your index fingers stretch the dam over the clamp. 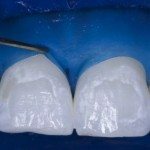 For more difficult interproximal contacts, use a waxed floss such as Glide by Proctor and Gamble. 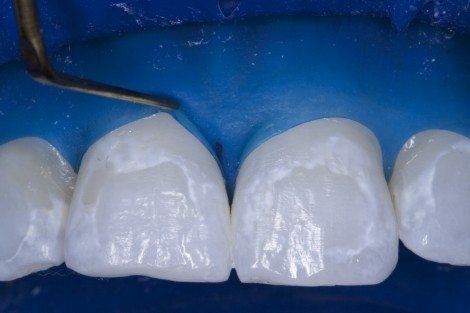 The lingual end of the floss is looped over and inserted into the contact, while caring down more dam with it. Remove floss by pulling both ends buccally without disturbing the dam. Using a black spoon, available from HuFriedy, tuck the edges of the dental dam into the gingival sulcus. If the patient is having problems breathing, cut a small u shape just under the nose so the nasal passage is not blocked, and the patient can breathe easy. Placement of the rubber dam should not be an option. With today’s new systems practice and placement makes perfect. Contemporary Product Solutions provides an expertise in clinical and laboratory evaluation of dental products and equipment from the total team perspective. Their mission is to provide the dental profession with clinically relevant information to all areas of the dental practice. Product review will provide unbiased, up-to-date, evidence-based information on equipment, materials, protocols of treatment, and long term performance. Each evaluation includes a step-by-step tech spec of each product, a clinical overview, a technique video, and an overall rating. This entry was posted in Bay View Dental Laboratory, Dental Continuing Education, Dental Records, Guest Bloggers, Mid-Atlantic Center for Advanced Dental Study, Treatment Planning, Uncategorized. Bookmark the permalink.